When polio was widespread, communication strategies often used what is known as risk communication, targeting individual caregivers with facts about polio and polio vaccination to inform caregivers and educate communities about the need to protect and vaccinate children. As the virus’ hold has shrunk to very limited parts of the world, communications has evolved to address the dynamic perceptions and social norms that deter caregivers in the remaining 1% of the world from vaccinating their children. The Global Polio Eradication Initiative’s shift to ‘social norm communication’ is led by UNICEF and grounded in recent polling research on populations affected by polio in endemic and outbreak contexts, and their responses to polio eradication efforts. Primarily, this research shows that families in high-risk areas are discouraged from vaccinating by the prevalent social norms. Communication strategies therefore aim to shift those norms, much as smoking has been shifted from the norm in many countries. The eradication of polio depends on the success of polio programme health workers (e.g., community health workers, social mobilisers, vaccinators). 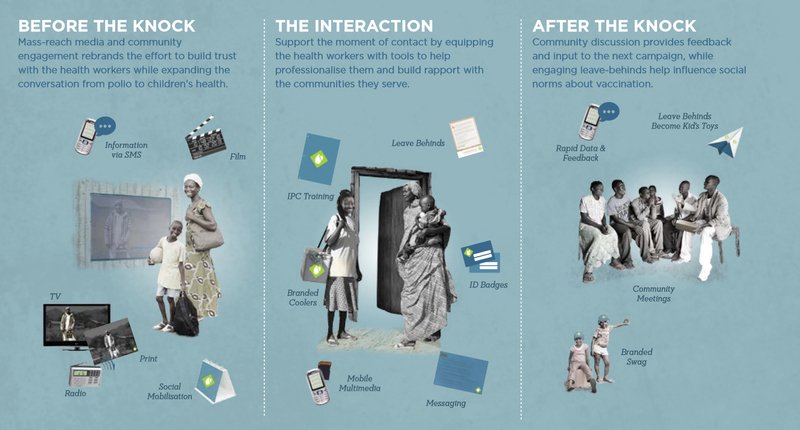 Their success in the field revolves around a single pivotal moment: the short, interpersonal interaction between health workers and caregivers, or ‘the knock’ on the door. A caregiver’s decision does not exist in isolation. It is both a personal decision, and a consideration of familial and community views about the act of vaccination itself. Is it celebrated or discouraged? Does the community respect the role of health workers? Community engagement does not just happen during vaccination days. It is an ongoing conversation with the community that requires an iterative loop of listening and responding. The Interaction – Supporting interpersonal communication and training so that the interaction at the door is the most effective it can be. After the Knock – Building toward constant improvement and increased levels of trust, seeking caregiver feedback is critical. UNICEF’s goal is to use this strategy to increase the uptake of valuable, life-saving services, such as the polio vaccine. 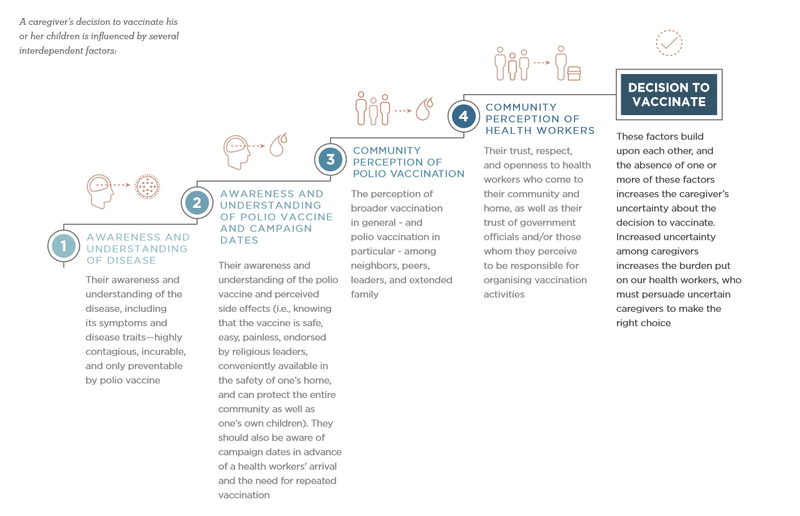 To do this, UNICEF needs to work with communities to build social demand for vaccination, and present the health workers as trustworthy, admirable, compassionate, helpful, and competent across all of the touch points and caregiver-targeted messages.